A stranger on the Cotswold Line. Laira allocated P461 (51318, 59470, & 51303) rounds the curve on the approach to Shipton station on 18 September 1982 with the 15:53 Worcester Foregate Street to Oxford service, despite it saying Didcot on the destination blind! 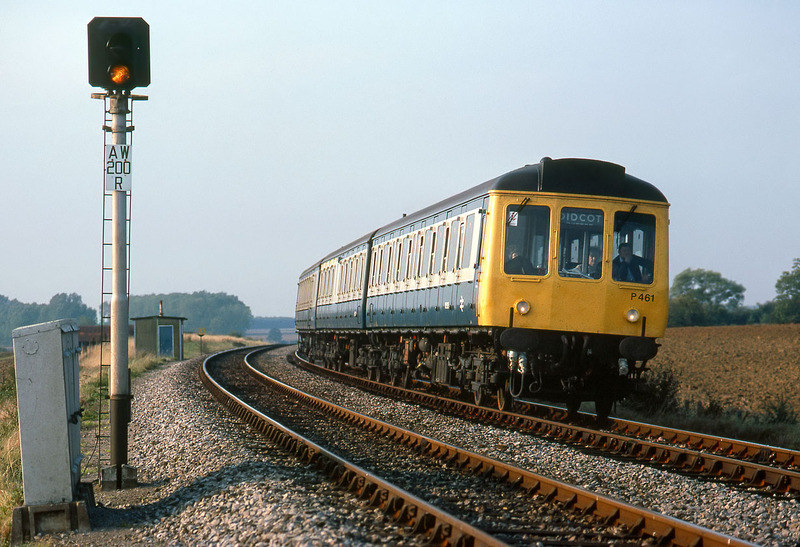 Class 118s were infrequent visitors to the Cotswold Line, with services normally being worked by the outwardly similar Pressed Steel Class 117s or the Gloucester Railway Carriage & Wagon Co. Class 119s. Ascott-under-Wychwood's signal 200 is effectively the distant signal for Bruern Crossing.